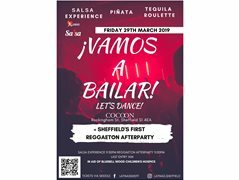 The 'Vamos A Bailar' charity event supports Bluebell Wood Children's Hospice and is taking place on the 29th March 2019 in Sheffield at Cocoon Nightclub situated in the city centre. The event needs a reggeaton singer to entertain attendees and bring an exciting vibe to the event. Benefits of CSR, promotions on Social Media and helping us achieve our mission, which is to raise as much money as possible for children with life-threatening diseases. Rehearsals will be on Friday 15th February 2019 at 14:30.